Die ‚Galerie Kaiser P’ ist ein offener Ausstellungs- und Projektraum im Frankfurter Bahnhofsviertel. Seit Ende 2012 zeigen hier Künstler_Innen aus verschiedensten Richtungen ihre Arbeiten. Von klassischer Malerei bis zu situativer Installation – der Raum lässt verschiedene Nutzungen zu und erlaubt ein exploratives und freies Arbeiten vor Ort. Im Rahmen der jüngsten Themenreihe werden Positionen vorgestellt, die sich mit dem Phänomenbereich ‚Aktivismus’ auseinandersetzen. Vom 26. 9 – 16. 10. 2014 zeigen wir ‚Dimensions Variable’ der Frankfurter Künstlerin Line Krom. Kroms Werke stellen Ausstellungsorte und -praxen in den Mittelpunkt. Verwaltungs- und Hängesysteme werden mit ihrer spezifischen auf Ordnungsstrukturen hin orientieren Ästhetik zitiert und inszeniert. Die orts-spezifische Installation ‚Dimensions Variable’ besteht aus weißem Galerie-Perlon, das üblicherweise als Trägermaterial für Galeriehängesysteme benutzt wird. Die Installation wird durch freiwillige Helfer, die ihre Arbeit im Kunstkontext unentgeltlich zur Verfügung stellen, realisiert. Die Arbeit der Freiwilligen wird von der Künstlerin choreografiert und ist als Performance zu den Galeriezeiten zu besichtigen. Ästhetische Diskurse werden mit aktuellen sozio-politischen Rahmenbedingungen in Beziehung gesetzt – im Kunst- und Kulturbetrieb liegen Idealismus und Selbstausbeutung dicht beieinander. Daher haben Menschen in Kroms Arbeit eine ,tragende Funktion‘, sind sie als ,Primary Structures‘ nicht vorhanden, gibt es keine Ausstellung. Diese riskante Versuchsanordnung lässt offen, ob die filigrane Installation bis zur Finissage vervollständigt wird. Line Krom geboren in Frankfurt, hat in Frankfurt, Berlin und London studiert. Ihre Arbeiten wurden mit dem wichtigsten Preis für zeitgenössische Zeichnung in Großbritannien, dem Jerwood Drawing Prize 2008 gewürdigt und u. A. mit Projektförderungen am Center for Drawing London (2008) und am CCA Kitakyushu, Japan (2010) ausgezeichnet. Ihre Werke waren jüngst in diversen internationalen Ausstellungen zusehen, Ona i ja – Wahlverwandtschaften, Galeria OFF, Łódź (2014), Dibujo, Galeria Taller Gravura, Malaga (2014), Il faut imaginer S. heureux, Klosterpresse, Frankfurt (2014), Fundamental Ephemeris, BronxArtSpace, New York (2013). Dieser Eintrag wurde veröffentlicht in Uncategorized am 21/09/2014 von adeuxinstant. Aline von der Assen curator of the show gave an introduction into ona i ja wahlverwandtschaften for the opening on Friday 5 September 2014. „… The subtitle Wahlverwandtschaften (Elective affinities) is a term borrowed from physical chemistry, which became a winged word after Goethe’s iconic novel Wahlverwandtschaften from 1809. This term expresses relationships with close friends or soul mates – relationships that are not created by family bonds but by choice. In the novel Goethe applies the metaphor of chemical substances forming compounds or resisting decomposition on human relationships. He uses the chemical equitation ab + cd → ac + bd to illustrate the relationships between his protagonists, explaining that couple ab meets couple cd and they form new matches ac and bd. Goethe’s metaphor applying mathematical equitations on social relations raises the question if kinship could be as predictable and calculable as chemical reactions. Today this idea doesn‘t sound outlandish to us as a lot of information about our habits, preferences, lifestyle and social/economical situations is produced and collected online. This not just happens passively, when browsing websites or adds on the internet, but often we actively upload our data when using apps like Endemondo, ,the Personal Trainer for your smart phone‘, SleepBot, ,the wakeApp, that logs your sleep, tracks movement and sound, and wakes you up at the best time each day‘ or Dating Apps like Tinder and Happn, which are supposed to ,help you to find people you have crossed paths with‘. So to which extend are human relationships calculable and predictable through mathematic formulas and computer algorithms? In Goethe’s story the chemical equation as symbolic representation proofs wrong: human passion and guilt get out of control and mar the clear connections of science and math. Two protagonists die broken hearted, the other two feel guilty and lack of happiness. Contemporary artists too deal with predictability and uncertainty of love and live. They use experimental set-ups to analyse relationships. Or they deconstruct culturally shaped images of ephemeral encounters and intimate relationships, images and ideas, which are viral in the media and advertisement. Tonight New York based video artist Keren Cytter presents her new video ,Siren‘. For her films Cytter employs aesthetics of amateur home movies and video diaries. Her video works blend fictional and non-fictional narrative and imagery of the media as presented in movies and soaps. Her narratives often appear scattered, fragmented and looped to highlight the way media strategies work and shape our social reality. ,Siren‘ is dealing with the stereotype of a love-murder-movie: two lovers killing the wife/husband. In ,Siren‘ a woman employs her lover to kill her boy friend but eventually her lover turns against herself too and kills her in mania. Zürich based artist Alexander Bühler presents a wall installation assembled of photos and texts. Referring to the image of the artist as flaneur, (visual) poet, scholar and dandy, strolling the touristy, neon lit night clubs in Bangkok and Fukuoka waiting for personal and random encounters, ready to consume and to be consumed. „The thing about traveling is that there are so many things you don‘t understand, and you will always end up in imagery worlds.“ is what Bühler comments on his new work ,The Journey‘. His blurred photographs and fragmentary texts communicate the aesthetics of being permanently on the move. Meeting random people and bringing different stories together. German artist Line Krom deals with the supporting system in the gallery space, it‘s institutional laws, regulations, structures, architectural and legal frame and the people that keep the space running (workers and audience). She quotes administrative and hanging systems with their specific aesthetics of normative structures. In updating the discourses on minimalism and Institutional Critique Krom demonstrates interest in the visual and cultural heritage of this influential period and its relation to contemporary visual and political culture. For ,Dimensions Variable‘ Krom hires young sleek model-esque men to hold her minimalistic installation in place. They become an integral part of the installation itself, because it is only while they are in place and holding the works that the composition is whole. Line Krom’s work is a fragile system and once the agreed time is up the installation collapses. Agnieszka Kolek a Polish artist and political activist based in London focuses on human relations, their complexity and interrelations. She moves from a microscopic view of one to one human relations to a wider one, where society chooses how to react to political events. She is particularly interested in human motivations behind ‘willful blindness’. Aleksandra Frankowska, a Lodz based painter, who is present tonight, is working from direct observation. In the painting process she focuses on the overlooked and ordinary. In her new work Frankowska approaches observation as aesthetic discourse of painting through the interaction with her students. She gives instructions to them and observes what and how they perceive. She applies these records in her own painting process. In employing other people in the production process of her work Frankowska touches on to current aesthetic practises found in participatorial and socially engaged art. These practises follow up a post-structuralist discourse in art, abolishing the idea of ,the authentic‘, and the authoritative artist by including different ,points of view‘ into the production of art work. Berlin based artist Astrid Stricker presents isolated protagonists in her recent drawings. Lonely people are wondering through suggested city scapes. The architectural fragments, blending partly with the figures. The outline blurs the barrier between building and human body. Rain, water floods and wind gusts create even bigger disorder and the whole composition describes a chaotic co-existence. Animism, is about the fantasy of (inanimate) objects being living entities which possess a soul. Interpreted by psychoanalysis animism describes an earlier stage of development through childhood, while for adults this condition is defined as primitive and pathologic. Both states form the opposition of control and predictability. So what is to gain of formulas and algorithms of social patterns from the artist’s point of view? Art has many different approaches. Contemporary art includes the audience and invites the viewer to create their own interpretation of the scenario. As Roland Barthes claims in ,the death of the author‘, the opinion of the creator is just one out of many possible interpretations. Art opposes and deconstructs the idea of predictability of social relationships. This stands in harsh contrast to contemporary societies desire and ideal of calculability for the many inevitable contingencies of live in general. When I tell my exhibition proposal to a friend working as an associate professor in computing sciences, he laughs at me and says: Well, even in mathematics and computing sciences it is often more efficient and easier to go for the trial and error route instead of developing a formula for a specific problem.“ (Taken from Aline von der Assen’s opening speech on Ona I Ja Wahlverwandtschaften, 5. 9. 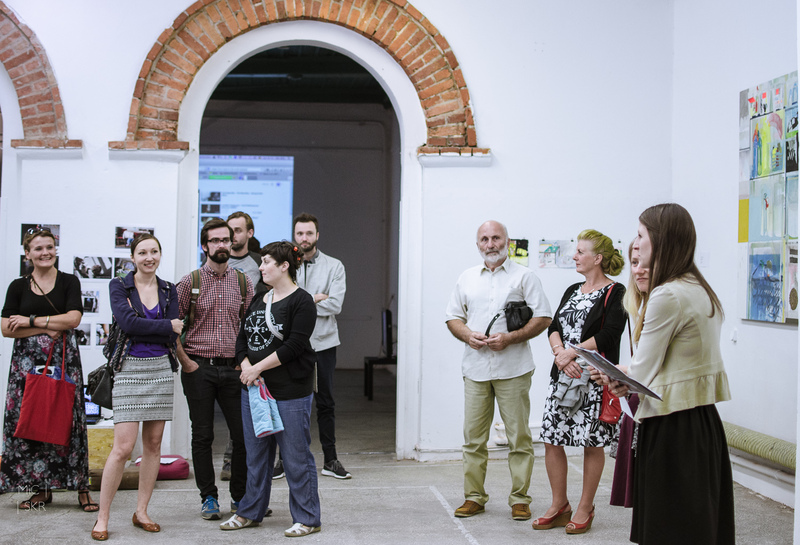 2014) ona i ja wahlverwandtschaften is running from 06 September – 18 September 2014 at Galeria OFF Piotrkowska, ul. Piotrkowska 138-140, 90-062 Łodź. Galeria OFF Piotrkowska is open from Mon – Sun 12:00-19:00 and on appointment. Pracownia OKO developed the gallery program for ona i ja wahlverwandtschaften. The participation in the program is free. Booking is required. Further information www.oko.edu.pl Images by the courtesy of the artists Alexander Bühler, Keren Cytter, Aleksandra Frankowska, Agnieszka Kołek, Ola Kozioł, Line Krom, Astrid Stricker, Stefanie Trojan and photographer Michał Skrzecz. Dieser Eintrag wurde veröffentlicht in Uncategorized und getaggt mit Agnieszka Kolek, Aleksandra Frankowska, Alexander Bühler, Astrid Stricker, Galeria OFF Piotrkowska, Keren Cytter, Line Krom, Michał Skrzecz, Ola Koziol, Stefanie Trojan, Wahlverwandtschaften am 09/09/2014 von adeuxinstant.